A quietish night at the club this week with many having alternate plans, still three interesting looking games.Firstly another match up with Andy’s Germans meeting Carl’s Romans using the second edition of WAB. The second game was a much belated outing for Firestorm Armada, here the Dindrenzi fleet have taken up defensive positions around the planet. A close of of a Dindrenzi Cruiser. Steve’s Aquan Prime ships are painted in a fantastic two tone blue which look even better in the ‘flesh’, here is a Poseidon class battleship and a Manta class battlecarrier. A Dindrenzi cruisers engine explodes leaving a distortion field, basically a tear in time and space. More Dindrenzi casualties as the Aquans start to bombard the planet. 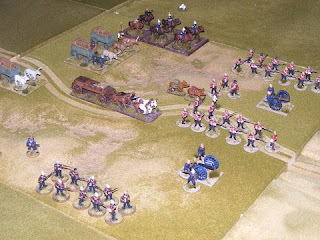 See Steves blog for his battlereport, the link is here. All the Spartan games have some nice mechanics and are pretty easy to play – just the thing for for a club game night as games can be set up at the last minute and use a minimum of terrain. A variety of races give opportunity for players to build small fleets of their own without having to spend a fortune. Dane and Chris gave the Napoleonic variant of Warmaster a go, with Russians face off against the French.